Yarn and Fiber Happenings: New Kauni Lace Weight, HiyaHiya in Stainless Steel, Eco Wool Galore and a Fun and Cozy Tea Party Class at the Yarn and Fiber Company! New Kauni Lace Weight, HiyaHiya in Stainless Steel, Eco Wool Galore and a Fun and Cozy Tea Party Class at the Yarn and Fiber Company! Kauni Effektgarn has arrived along with some new colorways! Introducing Kauni Effektgarn in Colorway EE one of the newest Kauni Effektgarn colorways -sure to please the pink lover in you! 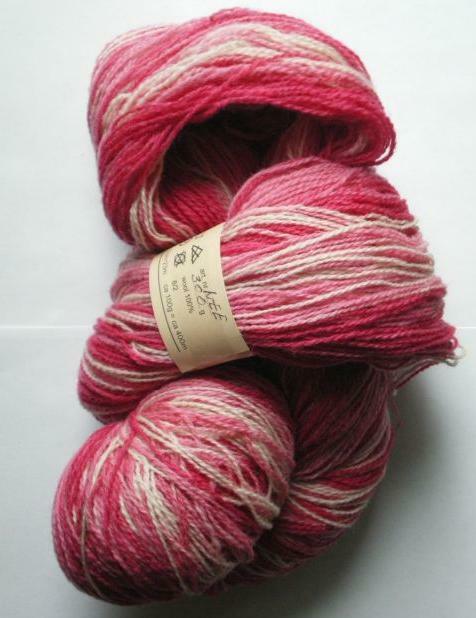 Also just in - Kauni Effektgarn Lace Weight! This fabulous woolen yarn is making quite a stir in the knitting world with it long striping effect and vibrant color schemes! Get some today and make every row a new experience in knitting! Very popular amoungst lace knitters! Kauni Effektgarn wool comes in a many colorways and each skein may have a different weight distribution and has been priced accordingly. Gorgeous! HiyaHiya's in Stainless Steel have been added to our needle line-up for your knitting pleasure. The Stainless Steel model are available in the following lengths - 9, 11, 12, 24, 32, 47 and 60 inches. Wow, such variety and a great price! Also, just restocked - all the colors of Eco Wool and Eco Wool Plus from Cascade.... this great yarn boosts 478 yards (441 m) per 8.75 ozs (250g) and is available for under $15 per skein! This is a great yarn for gift giving and lots of natural flavors as well as gorgeous colors are available. Check out this yarn and the great patterns available for free from Cacade Yarns. Live locally? Knit a Teapot Cosy and Tea Party! This is a new class offering at the Yarn and Fiber Company and it’s coming up SOON!! The class is called, Tea for Two and will feature two class sessions. Session 1 is scheduled for the following dates - September 27th and October 11th - you pick which one works for you. Session 2 will combine the groups and meet on November 1st for finishing up the tea cozies, displaying and showing off your tea cozies and having a real tea party! Perfect time to wear those fancy knits you’ve made - especially your lace shawls! Call us soon to register for this class or drop by for more details.... 603-505-4432 - hope to see you here. Yeah! Love it, love it all! Have a great and safe week!